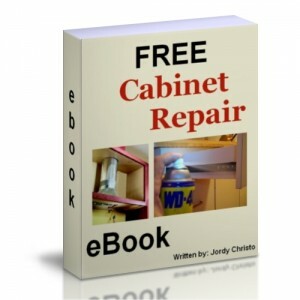 This free cabinet repair ebook covers a large range of subjects for fixing all types of cupboards. The ebook has the table of contents linked with each instructional. I started building cabinets in 1982 in the South Florida area. After working for three cabinet shops, over the course of eleven years, I opened the first of three businesses related to the kitchen and bathroom manufacturing industry. During the process of maintaining one of the cabinet manufacturing companies, I discovered that there was a market for all types of cabinet repair work. This discovery launched me into a new direction where I began to fix water damaged cupboards, fire damaged kitchens and made alterations to existing cupboards in order to make new appliances fit. I’ve done everything from adjusting cabinet doors to removing entire kitchen cabinet sets while leaving the counter tops in place. I’ve worked for insurance contractors, computer companies, hospitals and medical laboratories making existing cupboards work with new equipment or just fixing some sort of cabinetry damage. 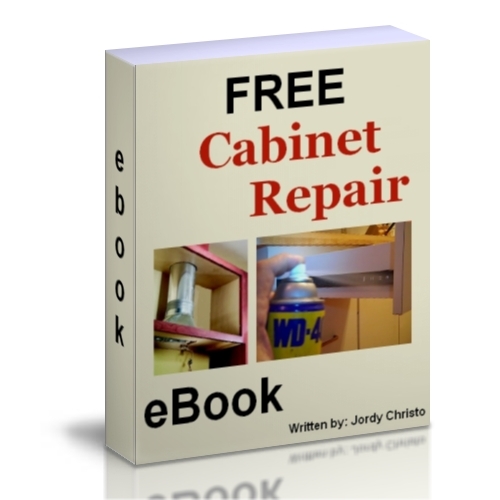 Within the pages of this eBook and our blog, you will find helpful tips on how to do a large variety of cupboard repairs. How to fix a Formica plastic laminate edge that is coming off of the countertop by using contact glue. There are a few things that you are going to need in order to do the repair to your laminate top.